Saturday we continued our adventure just as a party of 2, since the others needed to head home. We spent the weekend in Vancouver, taking advantage of great weather, a slower agenda, and fresh sushi whenever possible. Saturday morning the Engineer and I opted to walk off early carrying our luggage, instead of having the cruise line take it ashore for us. First time we have done that and it worked really well since we were able to disembark right at the time we had been asked to vacate our rooms. Would definitely recommend this option if you can handle your luggage and don't want to wait on the ship. We caught a cab to our boutique hotel in the Yaletown area of downtown and got breakfast at the Twisted Fork nearby. We actually had to search for some time to find a place to eat since we had walked off the ship at 6:30 am and most places were not even open yet on a Saturday morning. After a hearty breakfast, the plan had been to do a hop on/off bus tour, but it turns out there was a marathon happening downtown so many of the streets were closed until noon and the tour busses were not running! It was a bit of a scramble to figure out what to do since we were tired and did not have a backup plan, and it was too early to check into our rooms which is what we really wanted to do. We had already bought the bus tickets, so we hopped a cab to the Aquarium in Stanley Park to visit for a couple of hours and then started our bus from that area. The Aquarium was really nice, and had many large sea mammals and a great exhibit on British Columbia area sea life, however not as good overall as the one in Atlanta. We finally managed to get on the bus tour around 1 pm and spent the afternoon doing the two routes around the area, stopping for Tim Horton donuts (think Dunkin Donuts for Canadians) and the Maritime Museum which was an impulse stop but we both really enjoyed the ship they had dry-docked within the museum. It was the first to cross the Northwest Passage, and went with a fascinating exhibit about the quest for a way across North America by sea. We had dinner at a fantastic sushi place near the hotel. Their specialty is fish that is pounded flat and then lightly flame broiled before being placed in layers of sticky rice. It's called aburu oshi and this restaurant pioneered the technique a few years ago. Apologies - I forgot to take many pics today. On Sunday, we got up fairly early and ventured about 20 min north via Uber to the Capilano Bridge Park and Grouse Mountain. 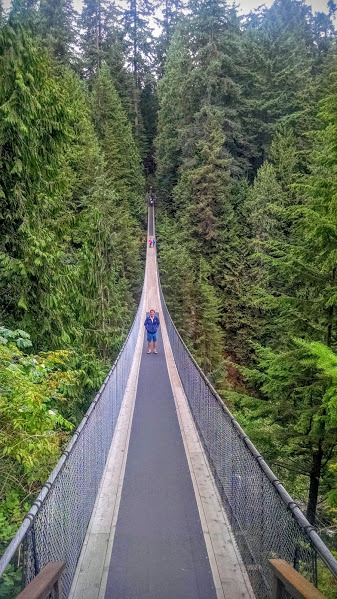 Capilano Bridge is a huge swinging suspension bridge that stretches 450 ft across and 230 ft high over the gorge. I was terrified to cross but managed to make it by holding the rail and not looking over the side and was rewarded with a canopy treehouse to climb on the other side and beautiful views of the river. The Engineer also braved the cliff walk which is a narrow path that goes along the ledge, but I opted to sit that one out. After exploring the bridge park for a few hours, we caught the local bus to nearby Grouse Mountain where we took a gondola up to the top of the mountain (instead of the 2800 stairs up) and explored the animal habitats and exhibits they had. They have 2 grizzly bears that were rescue animals that we got to see up close. I was disappointed I never got to see a bear in the wild, but at least I got to see a grizzly bear up close in a natural habitat. Also saw some hawks and eagles and caught the lumberjack show. The wolf did not make an appearance for us, which was disappointing. The Canadians appreciation for nature and the outdoors is clearly evident in the way they have these parks set up. They treat these as a family outing the way we might go to 6 Flags. Families of all ages and handicap levels were everywhere, as well as the usual tourists. We also saw lots of young adults from Australia and New Zealand, as well as local, working at these summer jobs which was great to see. Everyone was very friendly, helpful, and knowledgeable, which is a refreshing change from some of the jaded workers we see at DC tourist attractions. We turned in very early on Sunday as we are both fighting a cold that was going around. The last few days of the trip are low key so we will rest up. Monday we rent a car and travel by ferry to Victoria and then back to Seattle where we fly out on Tuesday.